We all need survival strategies to help us maneuver through life’s difficult days with some measure of sanity and grace. When the world threatens to overwhelm us, we need a plan: a way to hold ourselves together until the stormy weather passes, or perhaps a way to let everything fall apart without losing our faith completely. Here’s my favorite survival strategy: I close the door to my yoga room, tune in to my favorite track of Wah!’s Savasana CD, hit the repeat button, and slip into viparita karani, or legs up the wall pose, one of my best friends in all of yoga. I drape a lavender-scented eye bag across my brow, exhale as soulfully as possible, and then invite the music's soothing rhythms and the posture's quiet softness to sink into every cell of my body. I breathe. I melt. I surrender. My legs drain, my brain empties, my belly warms and settles. I linger here for ten minutes, twenty minutes, sometimes longer, until the magic of the pose drains every last drop of angst and agitation from my soul. And when I can bear to pull myself back to reality I roll over and sit up, refreshed and renewed. Inevitably I feel calmer and saner, and better able to manage life’s challenges with clarity and balance. I’ll wager that viparita karani has the power to do the same for you. This soothing and restorative posture calms the nervous system, eases muscle fatigue, and helps restore healthy, restful breathing. Many yoga teachers offer viparita karani as an antidote to exhaustion, illness and weakened immunity. In addition, this time-tested posture invites us to drop beneath the surface of life into quieter and more introspective realms within. To begin, fold two thick blankets lengthwise and stack one neatly atop the other, creating a support that is long enough to prop your hips comfortably, and that is at least six inches thick and about ten inches wide. (A yoga bolster works well, too.) Place the blanket near the wall with its long edge running parallel to the baseboard, leaving a gap of just a few inches between the blanket and the wall. The name of the game in viparita karani is to end up with the legs resting comfortably against the wall, with the pelvis and lower back supported on the bolster, and the upper body nestling quietly onto the floor. Getting there, unfortunately, is not necessarily a graceful affair. Some advanced yogis do a forward roll into the pose, but if you treasure your tailbone - or your wall - I wouldn’t recommend this strategy in the beginning. We’ll try a slightly less acrobatic approach. Sit on the blanket with the left side of your body next to the wall and your feet on the floor. Using your hands for support, slowly shift your weight onto the outer right hip, and then lower your right shoulder onto the ground beyond the blankets as you sweep your legs up the wall. Settle your back onto the floor, arranging your torso so that a line drawn from your nose to your navel would be perpendicular to the baseboard. As always in yoga, preparation counts. So spend a few moments attending to the details of the pose before diving into its depths. You’ll be rewarded for your care and precision with a deeper and more restful state of ease once you've settled in. Let’s start with the legs. Ideally in viparita karani, the legs should be straight and the backs of the thighs should rest against the wall, offering a gentle support that deepens the restorative benefits of the pose. If your back thighs aren’t touching the wall and you feel like they could without strain, then bend your legs and shimmy your hips a few inches closer to the wall, settling more of your lower back onto the bolster. If moving close to the wall causes your hamstrings to protest, however, then emerge from the pose, slide the blankets a few inches farther away from the baseboard, and try again. Experiment with the distance between the blanket and the wall until you find a position that offers a gentle stretch in the backs of your legs but doesn’t overwhelm you. It’s going to be difficult to find inner peace, after all, if your thighs are shrieking at you in protest. Consider your hips next. Your pelvis should comfortably rest on the bolster, with its two sides equidistant from the wall. The blankets should support you from the tailbone all the way to the kidneys at the mid-back, allowing the belly to feel evenly supported. To assure ample space in your midsection, release the base of the tailbone gently downward toward the little gully between the blanket and the wall. At the same time, extend the sitting bones away from the belly, as if they were being magnetically drawn toward the wall beyond you. 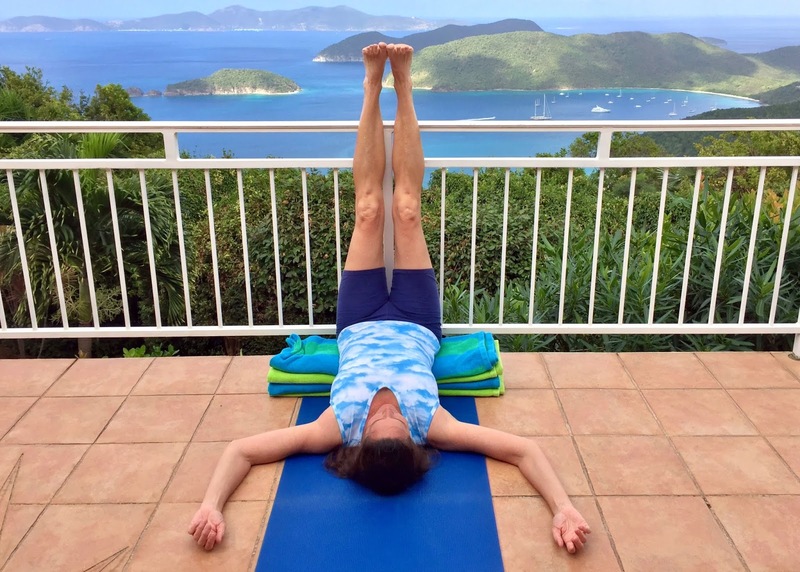 Here’s a good test of whether you’ve found this evenness in your midsection: Place your fingers on your bony hip points at the top of either side of the pelvis, and the thumbs on either side of the base of the front floating ribs. All four points should be the same height off the floor, allowing the contents of the belly settle deeply into the cradle of the back pelvis instead of tipping in one direction or another. Now let’s make sure the upper body is balanced and unwrinkled, too. Pick up your left shoulder, slip the shoulder blade down toward the waist, and then release the shoulder back onto the ground. Notice how much space you’ve created between the shoulder and the ear. Repeat this action on the second side. Rest your hands in a comfortable position, either out to the sides, on top of the floating ribs, or on the floor beyond your head. Enjoy this opportunity to let the shoulders root firmly into the ground, with the arms soft and the hands unclenched. Once you’ve nestled comfortably into viparita karani, your only remaining task is to close your eyes, exhale completely and surrender to the softness of the pose. Scan your body limb by limb, inviting any residual knots of tension to dissolve away completely. Let your brain grow easy and tranquil, relinquishing its grip on obsessive worries or fears that may still linger within. Enjoy the opportunity to grasp after absolutely nothing, at least for a few sweet moments. Let's drop inward layer by layer to observe the subtle sensations within. First shift your focus to the breath and observe how much freedom viparita karani offers the diaphragm at the base of the lungs, inviting the mid-body to participate whole-heartedly in your inhalations and exhalations. Take advantage of this opportunity, letting the belly peacefully and generously ride the waves of the breath. Invite the breath to deepen, and let every exhalation feel soul satisfying and complete. As your body softens, you may even discover a delightful pause developing at the very end of each exhalation - a moment or two of total stillness and spaciousness. Enjoy the tranquility and deep rest this settled silence offers. Now draw your awareness even beneath the breath, toward the shifting sensations of life pulsing through you. Trace the flow of energy that runs from your heels through the waterfall of your legs, into the warm lake of the belly, over the gentle waves of the ribcage, through the grotto of the heart, and all the way out through the channels of the neck and head, before melding back into the ocean of life beyond you. Enjoy the opportunity to be drained and emptied, and notice how calming this gentle inversion can be for both the heart and the head. Pause, breathe, and when you’re ready, drop inward again. Notice how beneath the body’s surface, beneath the rise and fall of the breath, even beneath the flow of inner energy, lies a tranquil refuge of quiet and ease. Observe how this stillness supports you, how even when you let everything you know about yourself dissolve, you are still held by the world. With each quiet exhalation, and with every ounce of letting go, you drop closer to the stillness that lies at the very heart of the universe. Linger in this soothing silence for as long as you like. When your body signals that it is ready again to move back into the world of action, slowly slide your legs down the wall, bending your knees close to your chest. Rest here for a few moments before pressing your feet into the wall and sliding your hips onto the floor. Don’t hurry - you’ve just emerged from the depths of life, after all, and may need a few moments to re-acclimate to the world around you. When you do sit up, observe how you feel in your body, breath, mind and heart. Ask yourself whether you feel a little softer and more centered than a few moments ago. Perhaps you also feel smoother, quieter and more at ease. Your journey through viparita karani may have even left you feeling a bit more like the calm, balanced, and tenderhearted creature you were always meant to be.